Maple Leafs fans tuning into the Conference Finals saw some familiar faces. Once the scapegoats of Toronto’s struggles and run out of town by fans and the media, Jonathan Bernier, Dion Phaneuf and Phil Kessel each made the Conference Finals with their new teams. Are they performing at a higher level than they were in Toronto or just passengers on better teams? And who won those trades in hindsight? Technically, Bernier was traded to the Anaheim Ducks for a conditional draft pick. The condition was if Bernier started at least half of the Ducks’ playoff games and Anaheim either won the 2016-17 Stanley Cup or made it to the Final, the Leafs would receive the Ducks’ 2nd or 3rd round pick respectively in the 2017 draft. Since none of that happened, the Leafs essentially traded Bernier for nothing. However, one popular theory is that Bernier was included in the trade three weeks prior, that sent Frederick Andersen to the Leafs in exchange for the 30th overall pick in the 2016 draft (Sam Steel) and the Leafs’ 2nd round pick in 2017. Bernier’s save % was consistent with his performance in Toronto and his 0.30 drop in GAA can be attributed to moving from one of the League’s worst defenses to one of the League’s best. The big change was in his record, which included a stretch of 12-0-3 in March and April when Gibson was injured, shooting the Ducks up to the top of the Pacific Division standings. Interestingly, while Gibson’s stats (.924 save % and 2.22 GAA) were better than Bernier’s, his record was much worse at 25-16-9 (Bernier won 66% of his games vs. Gibson’s 50%). 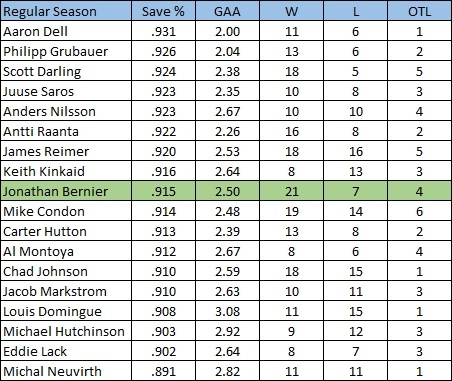 Bernier’s win/loss record is the best of the group but his save % and GAA is only average. In Game 3 of Anaheim’s first-round matchup against the Calgary Flames, Bernier replaced Gibson when they were down 4-1 and made 16/16 saves while the Ducks came back to win 5-4 in OT. It’s a credit to Bernier’s performance in that game as well as at the end of the regular season that had Anaheim fans calling for him to start Game 4. Carlyle stuck with Gibson in net but Bernier got back into action replacing Gibson in a lop-sided 7-1 loss to the Edmonton Oilers and again in the Western Conference Final against the Nashville Predators when Gibson was injured. Unfortunately for Bernier, he took the loss in Games 5 and 6 against Nashville and finished with a dreadful playoff stat line of .873 save % and 3.28 GAA. His reputation is becoming that of a goalie that can’t handle pressure (in the Toronto market or the playoffs). Bernier is a UFA this year and his future largely depends on his salary expectations. His past season earned him another contract in the NHL but not as a team’s starter. Best case scenario for him is to be with a good team that has an oft-injured starter, as in exactly where he is now in Anaheim. The problem with that is Anaheim’s cap situation. They likely won’t have any more than $1 million to spend on their backup goalie (they may not even have that much), so if Bernier wants to re-sign with the Ducks he’ll have to take a significant pay cut from the $4.15 million contract he had this season. Other teams seeking backup goalies this summer include New Jersey Devils, the Flames and Buffalo Sabres. The Phaneuf trade to Ottawa was mostly a salary dump on both sides, with Phaneuf being the only player involved that played a significant role in 2016/2017. Senators acquire: Dion Phaneuf, Matt Frattin, Casey Bailey, Ryan Rupert, Cody Donaghey. Maple Leafs acquire: Jared Cowen, Colin Greening, Milan Michalek, Tobias Lindberg, 2017 2nd round pick. 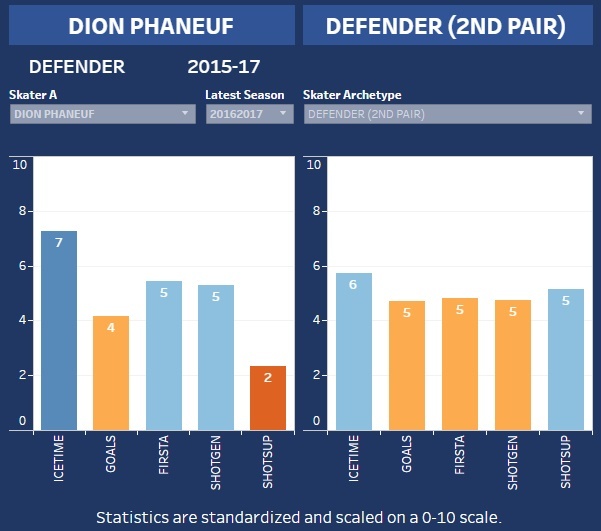 Expectations for Phaneuf are far lower in Ottawa when compared to Toronto. With the Leafs, Phaneuf was the captain and the #1 defenceman, while the Senators have him slotted in as a second pairing defenceman with Codi Ceci. He’s well behind the captain and best player, Erik Karlsson in terms of leadership with the Sens but he still plays an important role as an assistant captain. Otherwise, Phaneuf’s playoffs were forgettable, posting a total of 1 goal, 4 assists and a -3 in 19 playoff games. Until now, the Phaneuf trade has been just fine. The Senators shed enough salary to be able to easily afford Phaneuf and he has been a decent 2nd pairing contributor. However, all of the traded salaries are now coming off of the books for the Leafs and the Sens are stuck with Phaneuf’s whopping $7 million contract for the next 4 years. To put his contract into perspective, he is tied with Drew Doughty as the 6th highest cap hit among defensemen, behind P.K. Subban, Shea Weber, Dustin Byfuglien, Ryan Suter and Kris Letang. Unless Phaneuf decides to waive his No Movement Clause, he will be a Senator until 2021, which will cause problems for Ottawa in terms of adding talent or affording the massive raise Karlsson is due when he becomes a UFA in 2019 as well as making room for defence prospect Thomas Chabot. Leafs acquire: Kasperi Kapanen, Nick Spaling, Scott Harrington, 2016 1st round pick (traded to Anaheim for Andersen) and 3rd round pick (James Greenway). Toronto also retained $1.2 million in salary per year in the deal. Similar to Phaneuf, Kessel has far less weight on his shoulders in Pittsburgh than he did in Toronto. Sidney Crosby and Evgeni Malkin are there to shoulder the expectations and help with the offensive production. Kessel’s goals per 82 games with Pittsburgh is down to 25 goals from 33 in Toronto, while his assists have remained about the same. 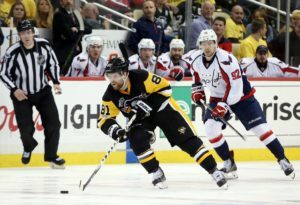 Kessel’s 0.94 career playoff ppg is 8th among active players, behind only Crosby, Malkin, Claude Giroux, Ryan Getzlaf, Patrick Kane, Jaromir Jagr and Jason Spezza (minimum 50 playoff games played). Kessel is signed with Pittsburgh through the 2021-22 season, along with Crosby, Malkin, Letang and Olli Maatta, forming a formidable core that will be a contender each and every year. If these Leafs are able to progress to the point that they make the Eastern Conference Final in the next five years, there’s a decent chance that Toronto will match up against the Penguins and be paying $1.2 million of Kessel’s $8 million AAV to play against them. First Place Winner: Pittsburgh Penguins. They have one Stanley Cup since Kessel’s arrival and possibly a second on the way. Can’t argue with this one. Second Place Winner: Toronto Maple Leafs. Shedding Phaneuf and Kessel allowed them to tank enough to draft Auston Matthews and Mitch Marner and the Leafs were also able to add their goaltender of the present and future in Andersen, Kasperi Kapenen and a few draft picks. Third Place Winner: Anaheim Ducks. 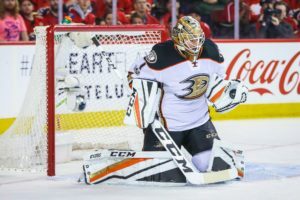 The Ducks lost out on Andersen but with Gibson on the roster, they don’t need him. One could argue that Bernier’s run in March and April earned the team home-ice advantage for Game 7 in the second round against Edmonton, helping the Ducks win the series. They also have a promising prospect in Sam Steel. Fourth Place …. Winner?/Loser? Ottawa Senators. To date, this trade is a win for the Sens as Phaneuf helped them to the Eastern Conference Final this year. However, of the four teams involved in these trades, Ottawa is the only one with negative consequences, as they have to deal with Phaneuf’s $7 million contract over the next 4 years.